What Do You Think Of The Growing Technology Gap? Many of us know someone older that talks bout and asks about how they are suppose to use any or all of these great new social networking platforms. Are older Americans (baby boomers & seniors) becoming more and more isolated? Is there a way to teach older Americans how to get more involved? We want to know your opinion on this subject. Do you feel that our parents and grandparents are becoming more and more isolated because they have difficulty keeping up with the speed that technology continues to develop? We feel that this is happening even faster than we have been able to realize. The connection and communication capabilities that many of us take for granted have take older Americans and baby boomers by complete surprise, leaving them somewhat clueless and unable to utilize all the great communication technology available including everything from texting, to emailing and popular networking portals like Facebook, Twitter and You Tube. We would like your opinion on 2 key questions. Please leave any comment in the comment section below. 1. 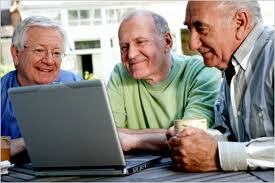 Do you agree that the explosion of communication technology has left this demographic behind? 2. Do you think a well designed education curriculum, geared to teach the basics of the most mobile communications, texting and using websites like Facebook would make this demographic feel better and less isolated? Your opinion and feedback of any kind would be greatly appreciated. Your input or opinion may help us create a better learning solution. This gap is ever widening and a solution may help many of our friends and family use technology more efficiently.